By the year 2050, you may be forced to become a vegetarian. That is, if Sweden's water scientists are to be believed. According to the Stockholm International Water Institute, "There will not be enough water available on current croplands to produce food for the expected 9 billion population in 2050 if we follow current trends and changes towards diets common in western nations." Humans now derive about 20 percent of their daily protein intake from animal-based products, reports London's Guardian. But a new report published by the institute says the world's population will have to cut that figure to 5 percent by 2050 to accommodate the planet's "considerable regional water deficits." Why not just produce more food? "Nine hundred million people already go hungry and 2 billion people are malnourished in spite of the fact that per capita food production continues to increase," the report said. "With 70% of all available water being in agriculture, growing more food to feed an additional 2 billion people by 2050 will place greater pressure on available water and land." 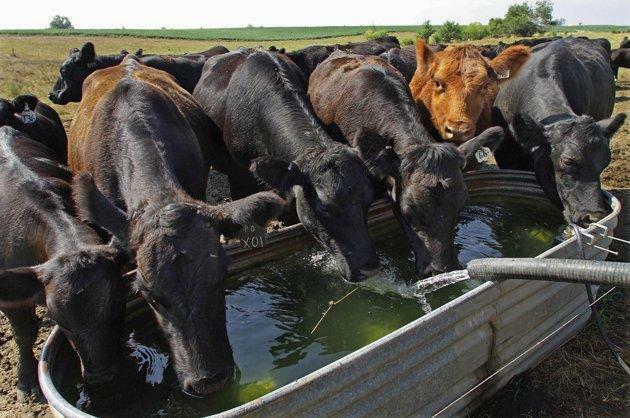 So vegetarianism, the scientists say, is one option to combat the water shortage. "A move towards vegetarian diets could help free up large portions of arable land to human food production," Orion Jones wrote on BigThink.com. "A third of current farmland is used to grow crops that feed animals. Additionally 'animal protein-rich food consumes five to 10 times more water than a vegetarian diet.'" The report was released for the start of "Water Week" and the annual world water conference in Stockholm. And while the forecast may sound dire, the world's water situation is already grave. According to the World Water Council, 1.1 billion people now live without clean drinking water. And the United States is experiencing its worst drought in a generation, punishing farmers and burning up the nation's corn crop. On July 31, nearly 65 percent of the nation was experiencing drought conditions, according to the U.S. Drought Monitor. The drought's been so severe and water levels so low, Midwestern towns that were intentionally submerged decades ago are starting to surface.